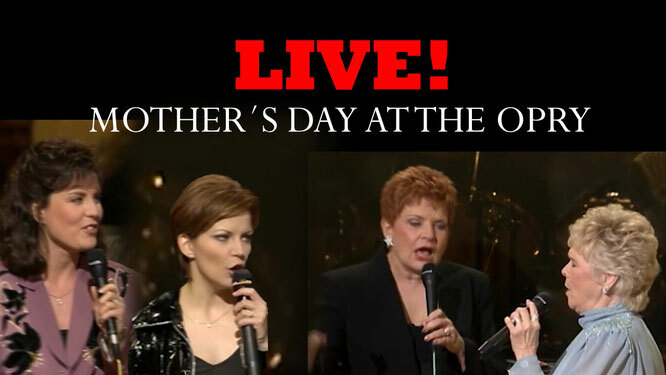 Mother´s Day at the Opry! Martina McBride, Holly Dunn, Jeanne Pruett & Jean Shepard Live! - Newhillbilly website. 100% American Roots Music. styled crossover sound, similar to that of Shania Twain and Faith Hill and has had a string of major hit singles on the Billboard country chart and occasionally on the adult contemporary chart. Five of these singles went to No. 1 on the country chart between 1995 and 2001, and one peaked at No. 1 on the adult contemporary chart in 2003. She has been called the "Celine Dion of Country Music" when she was recognized for her soprano singing range. McBride has recorded a total of 13 studio albums, two greatest hits compilations, one "live" album, as well as two additional compilation albums. Eight of her studio albums and two of her compilations have received an RIAAGold certification, or higher. In the U.S., she has sold over 14 million albums. In addition, McBride has won the Country Music Association's "Female Vocalist of the Year" award four times (tied with Reba McEntire for the second-most wins) and the Academy of Country Music's "Top Female Vocalist" award three times. She is also a 14-time Grammy Award nominee. Kathleen Alice Mattea (born June 21, 1959) is an American country music and bluegrass performer who often brings folk, Celtic, and traditional country sounds to her music. Active since 1984 as a recording artist, she has charted more than thirty singles on the Billboard Hot Country Songs charts, including four that reached No. 1: "Goin' Gone", "Eighteen Wheels and a Dozen Roses", "Come from the Heart", and "Burnin' Old Memories", plus twelve more that charted within the top ten. She has released fourteen studio albums, two Christmas albums, and one greatest hits album. Most of her material was recorded for Universal Music Group Nashville's Mercury Records Nashville division between 1984 and 2000, with later albums being issued on Narada Productions, her own Captain Potato label, and Sugar Hill Records. Among her albums, she has received five gold certifications and one platinum certification from the Recording Industry Association of America (RIAA). She has collaborated with Dolly Parton, Michael McDonald, Tim O'Brien, and her husband, Jon Vezner. Mattea is also a two-time Grammy Award winner: in 1990 for "Where've You Been", and in 1993 for her Christmas album Good News. Jeanne Pruett (born Norma Jean Bowman January 30, 1937 in Pell City, Alabama) is an American country singer and Grand Ole Opry star, best known for her 1973 country hit, "Satin Sheets", that spent three weeks at No. 1. "Satin Sheets" is Jeanne Pruett's signature song. The song sounded much more country than the songs that were coming out of Nashville at the time. When "Satin Sheets" became a hit in 1973, it was also a Top 40 Pop hit. Ollie Imogene "Jean" Shepard (November 21, 1933 – September 25, 2016) was an American honky tonk singer-songwriter who pioneered for women in country music. Shepard released a total of 73 singles to the Hot Country Songs chart, one of which reached the No. 1 spot. She recorded a total of 24 studio albums between 1956–81, and became a member of the Grand Ole Opry in 1955. After Kitty Wells' 1952 breakthrough, Shepard quickly followed, and a national television gig and the Opry helped make her a star when few female country singers had enduring success. Her first hit, "A Dear John Letter", a 1953 duet with Ferlin Husky, was the first post-World War II record by a woman country artist to sell more than a million copies.